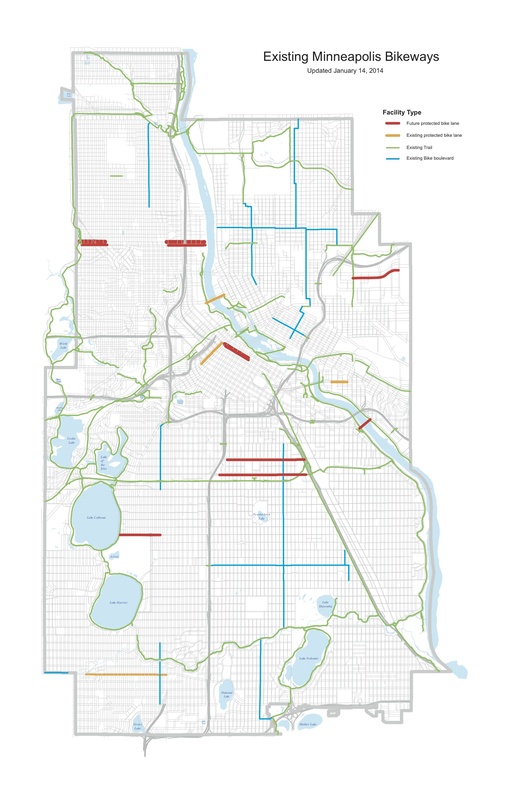 This is a map of Minneapolis's protected bikeways (larger version). The red lines indicate protected bike lanes that the city plans to build in the next year or two. Think of destinations you visit regularly: local businesses, museums, grocery stores, schools, and places of worship. Is there a way to connect them to the existing network? This is a map of Minneapolis's population density (larger version). Dark purple means there are more people per square mile, and light purple means there are fewer. How can we make the most of limited resources? A protected bikeway built near a cluster of apartment buildings would likely serve more people than one built in a less-dense neighborhood. On the other hand, all of Minneapolis deserves reasonable access to high-quality bike infrastructure. It's a balancing act. This map shows where people work in Minneapolis (larger version). The dark purple splotches stand for the two main job centers in the city: downtown and the University of Minnesota. As Walker Angell argues in streets.mn, a high rate of bicycle commuting shouldn't be our only goal, but it's an integral ingredient in the recipe for a bike-friendly city. Where do people ride on the sidewalk? Last year, the City of Minneapolis released a report on bicyclist-motorist crashes. The report (PDF) analyzed ten years of crash data, and contained maps showing the most dangerous corridors for cyclists. Some maps show the raw number of crashes, but this one shows the crash rate: the number of crashes per one million bicycle miles traveled. You'll notice that this corroborates the story told by sidewalk-cycling map. Hennepin and 28th Street, Cedar Ave and Riverside, and Central Ave and Lowry are all covered in red and orange. These maps don't tell the whole story of our city. There are places of worship, grocery stores, and schools that I didn't mention. Each neighborhood has its own needs, and any bike plan should take those needs into account. Also, each street has unique opportunities and challenges that only the engineers and planners know about. That's why neighborhood organizations should get involved with Bikeways for Everyone to learn more and to help shape the bike plans of Minneapolis and Hennepin County. Let's work together to move our community forward.